tags: bladedance of elementalers anime Ibuki Kido Kana Yuuki Shizuka Ishigami Saori Oonishi Ai Kakuma 精霊剣舞祭＜ブレイドダンス＞ source on ending theme. https://i.imgur.com/IUWfiPr.png it seems that video is missing for iroha's insane, I dont have it enabled. Okay so we had an IRC and the rhythm I suggested was applied, proceeding to mod the rest. Hitsounds are bland. There is no actual whistle hitsounding present. 00:06:097 (4,1,4) - you could for example place whistles on these notes which are to my ears the loudest bagpipe notes. Keep in mind that in folder you use soft-hitwhistle that sounds like a drum-hitnormal or normal-hitnormal. This may sound a bit complicated, but the current soft-hitwhistle could be renamed to drum-hitnormal, and all sounds that are currently on whistles are to be moved to drum sampleset, https://i.imgur.com/DHzglwV.jpg . By doing this, you can do soft-hitwhistle hitsounding to spice up the map (similar to how they sound on default skin) while still having this drum hits done. Whistles are generally used for high-pitched sounds. Usually this current method is acceptable if the song is really deep pitched. In case you didn't understand me well, contact me irc. The kiai section should use "finish" hitsound on cymbals such as 00:47:648 (1,1,1) -. If you agree, apply "finish" to other cymbal sounds as well in the kiai. General problem in the kiai that I have is that 00:47:327 (7,8) - these jumps are too small. Both have vocals on those notes, and especially (8) which has a more important one. 00:48:771 (9) - or this. It should be a good idea to increase the spacing to every second note after 5stack like those I linked as contrast.I intend to suggest big changes https://i.imgur.com/9X2lk5t.jpg to spacing, 2.8x+. Applies too all similar parts of course. 01:09:947 (3) - The vocal phrase starts from here, so I highly suggest having this nced since the spacing increases from here too. 01:15:081 (3) - Same applies to this. 01:17:327 (1,2,1,2,1,2,1,2,1,2,1,2,1,2,3,1,2,1,2,1,2,1,2,1,2,1,2,1,2,3) - By following my suggestion of hitsounding, you can put whistle on every "HAI" in the song to follow the vocals. Same hitsounding suggestions here. I approve of the style, but I'm interested in what might others have to say about this diff, do you think you could fetch a mod or two? 00:05:455 - to 00:10:589 - I am generally confused to why you changed the rhythm after the interval I linked. I really liked hais being followed, and never was the rhythm for hais used ever again in the map. There was no obvious change in music to warrant this. I would've preferred if you haven't used the "hai" rhythm (which I really like) if you had no intent to reuse it again. 00:30:963 (7) - This is actually an empty note. You should make the previous note a slider to fill it, not make it the most spaced, it's not even a hihat. If you wanted this part to be jumpy and intense, a good improvisation might be to make 00:30:161 (3) - into two circles since the sliderend covers a drum hit. Drum hits are really nice for making jumps tbh. 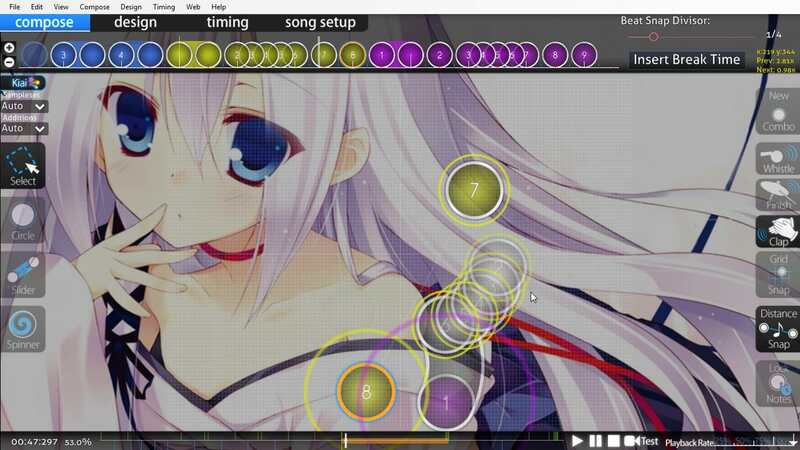 00:46:525 - I notice that you're a somewhat freestyle mapper, not putting much thought into every detail, which I like, however, in the kiai I think you could have an empasis system going. Currently nothing really grabs my attention. What I'm aiming at is 00:47:487 (8) - these notes, white ticks before the guitar offbeat. Imo they have bigger impact than other vocal notes such as 00:47:166 (6,7) - and in the map it could be represented better. The example I linked has a bit bigger spacing, but it's not enough to grab attention, something like 2.6x-3.0x is what I'd say gives impact. In case you agree that this could be the main note to emphasize, you might consider lowering 00:47:648 (1) - spacing relative to the white ticks I'm talking about, something like 2.5x I guess? It is a guitar hit which warrants a slider, but the vocals are not really intense to suggest high spacing is why I believe that this might be the way to go. 00:56:311 (5,7) - These two notes don't exist in the song, not even drums. If you'd like, you can make 00:56:150 (4,6) - these two into 3/4 sliders to emphasize them and overall make it similarly intense. 01:27:273 (7) - Consider making this a slider like neoSL did, seems like a nice touch. 01:09:947 (2,3,4,5) - you have been giving emphasis and bigger spacing to impactful vocals like 00:22:140 (1,2,1,2,1,2) - but not here. I think the vocals are pretty loud, going in 1/2 intervals and should considered to be the most spaced part in this section. 01:15:081 (2,3,4,5) - same goes here. First step is to make the slider into 2 circles and then make a jumpy pattern in case you agree. 01:03:851 (3,4) - These hitsounds sound weird. I don't think you should have them on "finish". 01:26:311 (1,2,3,4,5) - I don't think jumps are okay, will really surprise hard players and make them mad when they either fail or miss here. 00:18:289 (1) - missed clap on sliderend. 00:20:856 - suddenly no hitclap hitsounding on this section? 00:20:856 (1) - Only this sliderend had a clap on a snare. 00:46:525 (1) - no "finish" on cymbals, you should add them. 00:47:648 (3,1,3,1,3) - applies to this etc. Call me back when you think it's ready. about finishes on kiai,why? its kinda weird on little sounds and in vocal imo. Last edited by Djulus December 4, 2017 at 7:51:05 AM GMT , edited 1 times in total. djulus asked me to take a look on his difficulty. tags: bladedance of elementalers anime Ibuki Kido Kana Yuuki Shizuka Ishigami Saori Oonishi Ai Kakuma 精霊剣舞祭＜ブレイドダンス＞ source on ending theme. tbh tags doesn't matter at all. just better for fine, I don't think people will find this song searching by that words. The kiai section should use "finish" hitsound on cymbals such as 00:47:648 (1,1,1) -. If you agree, apply "finish" to other cymbal sounds as well in the kiai.not symbol sound there, only starting kiai part has symbol. 01:03:851 (3,4) - These hitsounds sound weird. I don't think you should have them on "finish".lol I couldn't find finish sound? maybe deleted by copying HS. 01:26:311 (1,2,3,4,5) - I don't think jumps are okay, will really surprise hard players and make them mad when they either fail or miss here. this part should be have emphasis. you asked for a recheck on thread and emm, please do copy or do something with djulus hitsounds. Generally I am okay with top diffs hitsounds, now to copy it on lower diffs eh? Also be sure to add finish hitsound on battle diff too the cymbals on kiai. Why not add tags? You never know who might find in what way a map, no reason not to add them. Last edited by MaridiuS December 11, 2017 at 11:45:51 PM GMT , edited 1 times in total. I think it would be more interesting for 00:05:776 (3) - to have the same curve as 00:06:418 (6) - doing so I think gives the vocal more importance as that would be the highest point of the pattern if you were to put an NC on 00:06:097 (4) - You applied this concept 00:08:343 (3,6) - so I think it would look more organized to do it here as well. 00:09:947 (4,5) - I think the way these patterns connect visually contradict the sounds they're mapped too. Yes, they're mapped to the 3 vocals in a similar fashion as done at 00:07:059 (3,4,5) - but they didn't have the clap finishes giving them extra emphasis, so I think the pattern should be slightly different accordingly. https://puu.sh/yEnHj/770dea98ad.jpg Could you try a pattern like this? I feel the difference in angles gives emphasis accordingly yet visually groups these notes into 3 like before. 00:24:707 (1) - I feel like because you keep the same circular motion as 00:23:423 (1,4) - this feels like it has less emphasis than implied as you tend to reverse the flow every 2 white ticks. 00:54:546 (3,4,5,6) - I think the rhythm here should be the same as 00:49:412 (3,4,5,6) - as they're both mapped where this section of the song loops / ends, so they serve as the 'finisher' of this section. 00:41:391 - vs that part in top diff, one is whistle spam (which is quiestionable imo) when the top diff is drum hitsound, please make it consistent it drums too, I don't really dig the whistles. 00:00:322 - to 00:36:257 - the whistles are inconsistent... 00:03:690 (5) - In the intro there are no whistles on these notes, up until 00:11:392 (5) - , so between 00 and 11:392 you should also put whistles on those notes, the music didn't seem to change that much. 00:20:856 - Has different whistle patterning, spamming it on white ticks while this was not done before, seems really out of place tbh. 01:10:268 (4,5) - okay now i'm confused, is this some method where you vary the hitsounds, I didn't really see that before tbh, the songs melody doesn't seem to be any different than what it was for different hitsounding style to be warranted. overall I think getting the whistle's to be consistent should be the way to go considering the song's melody doesn't change at all. 01:27:273 (1) - the green lines are not making the sliderbody more silent because its on same sampleset. So no need to slowly decrease if it doesn't work (I don't think it shouldn't even in general decrease since I think the sliderslide gives a nice noise). If you want to silence the sliderticks, use 5% on the first greenline 01:27:434 - here and delete the rest (except the first one lol). 00:57:916 (1) - inconsistent with 01:00:482 (5) - , I think both should be not NCed. 01:27:273 (1) - the green lines are not making the sliderbody more silent because its on same sampleset. So no need to slowly decrease if it doesn't work (I don't think it shouldn't even in general decrease since I think the sliderslide gives a nice noise). If you want to silence the sliderticks, use 5% on the first greenline 01:27:434 - here and delete the rest (except the first one lol).wanted to add some sounds at 01:27:273 - , I added clap sound, I think this song can be added clap on here, and deleted all sounds from 01:27:354 - . 00:57:916 (1) - inconsistent with 01:00:482 (5) - , I think both should be not NCed.lol my fault. all fixed and changed battle's because I think he intended drum sound on note which has a whistle hitsound. ask battle to confirm what's going on. some more finishes can be added to emphasize cymbals: 00:05:455 - 00:08:022 - etcetcetc. ↑ i can agree with this, but didn't see your reply?